I love my bedroom, Its my favourite part of the house. I opted for a grey and white colour scheme. I love the light airy colours they are so relaxing and spacious which is perfect for when I need an escape and equally perfect to use this as my work space too which is what I tend to do. 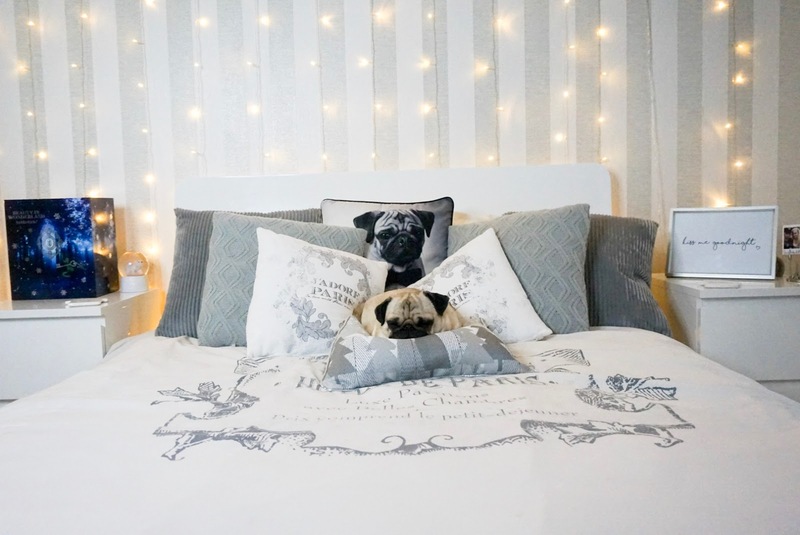 I thought I’d give you the perfect way to transform your bedroom into a cosy little haven. Fairy lights are every blogger/youtubers dream! These specific ones are from Amazon I think they were around £15 and they are 3mx3m which is pretty big. I can’t express how much they make a difference to a space. I’ve had them for a year and I still get excited putting them on in the evenings to cosy up to my boyfriend and little pug. They make the prettiest backdrop for blog photos and I really want some in the lounge because it just makes it feel so nice and like your in a little log cabin. They are also really good to use as a backdrop for photos which is another reason why I love having them. I love making my bed every morning it just looks so much prettier than a messy bed and mainly because I am obsessed with my cushions. I have 2 huge corduroy cushions from Asda which were only £7 and honestly they are the comfiest, softest, cosiest cushions ever!! The little grey and silver one with the trees on is from Asda for £6 too (which Louie has taken a shine to). 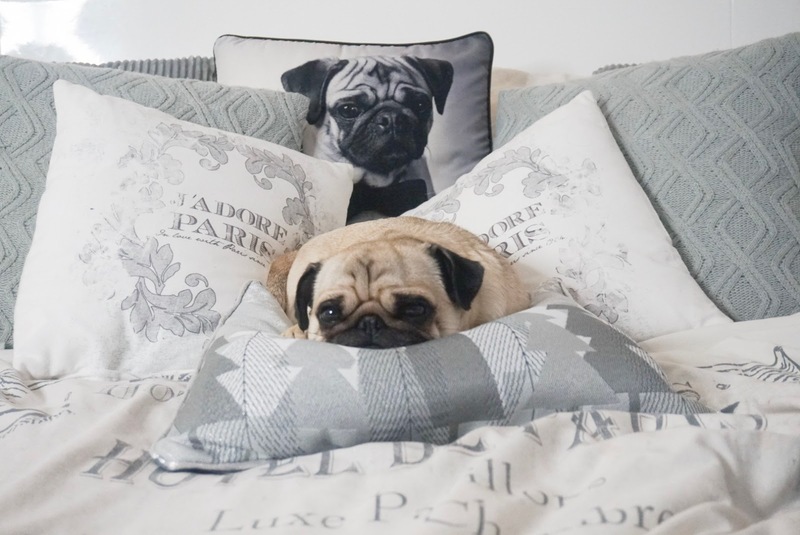 I’m obsessed with Paris so I have french inspired bedding and 2 cushions to match and obviously my huge pug cushion! I love my bed so much, I love the gloss white bed it matched my dressing table and bed side tables perfectly. I love this room but I definitely needed a little personal touch and I really wanted some cute prints for my work space/bedroom and Jazmyn kindly sent me two of her prints that she created which I am incredibly grateful for she has a business called Bliss Prints UK you can find her business instagram ‘here‘. I have already got my eye on 3 more for my kitchen that I cannot wait to buy myself! I went for this first print for my bedside table which says ‘Kiss me goodnight’ I just thought it was super cute and my bedside table was looking super bare but I just think the quote is cute and well fitted for the bedroom. The second print I got was this ‘No matter how you feel, Get Up, Dress Up, Show Up and never ever give up’ and I love it! This is on my dressing table which I think suits it perfectly as its where I tend to get up and get ready and it’s just the perfect little motivational quote when I get up in the morning to get ready for the day or if I’m sitting on my desk ready to work. It’s a nice little pick me up if I’m having an off morning to quickly help me snap out of it. 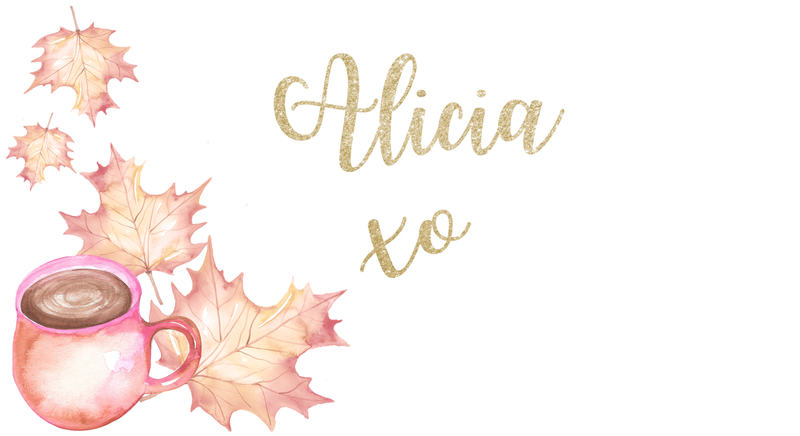 Next Post The Relaunch of Alicia á la Mode!